Our thematic units come from our connection with our local communities. The school curriculum integrates all subject areas within social studies themes. These themes are selected to be both age appropriate and exciting for students. At Greene Hill School there is a belief that the community plays an important role in the education of children, and therefore our thematic units come from our connection with our local communities. As children get older and can grasp concepts of time and space, our curriculum branches out to the larger communities of New York City, New York State, the United States of America and the world. Thematic units are not predetermined. They are chosen based on teacher and student interests. However, there are some general themes and specific concepts that are addressed each year, ensuring that students experience a rich, comprehensive curriculum over the course of their time at Greene Hill School. Family and community are a child’s first educators for our 4 year old students. In our 4s, children look to themselves and their families to begin identifying who they are in the world. As they move into formal schooling, children are best served by strong connections between their home, their school, and their community. At Greene Hill School, we value the interactions children have with the people in their neighborhoods as one way to help establish their place in the world. When children are actively engaged in their world, and parents and teachers provide thoughtful guidance, both their intellectual curiosity and emotional development is supported. Each year, the children expand on their previous experiences and knowledge to begin thinking about their place in school and their neighborhood. Young children have many opportunities to play. Through play with open-ended materials such as blocks, sand, paint and water they explore and practice concepts of literacy, mathematics, science, social studies and the arts. 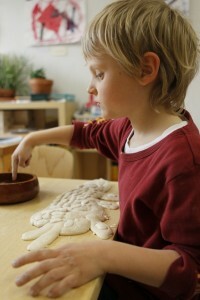 As children grow, first hand experience continues to be integral to learning. The work of 4s through 6s focuses on local themes. A basic guiding question such as, “Where does our food come from?” leads to an integrated study of farms, markets and nutrition. Children learn about the people and processes involved in food production, delivery and preparation. The children take trips to the community garden, farms, farmers markets, the food co-op, supermarkets, and restaurants. A question such as “How do people get around New York City?” leads to an exploration of the transportation system. Trips on the variety of modes of transportation follows. In addition, the class might visit the NYC Transit Museum, major transportation hubs, and if possible a bus depot, a train yard and an airport. 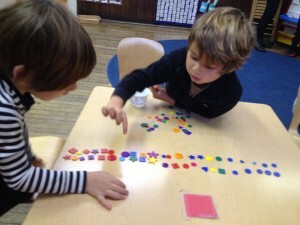 Math activities are introduced in relation to the theme. 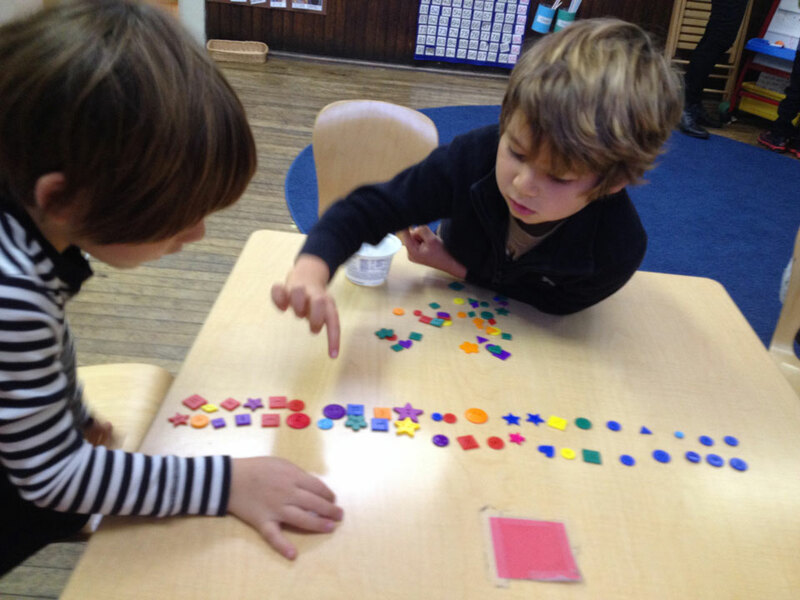 Activities may include, but are not limited to sorting, classifying, graphing, counting, comparisons, measuring, identifying and creating patterns, and basic arithmetic. Literacy is integrated through read alouds, guided reading, independent reading, journal writing, the creation of class books, and other shared reading and writing experiences. Science related to theme is introduced. With a food based theme, science comes into the classroom through cooking, and exploration of nutrition and our digestive system. In addition, through a visit to the community garden, children begin an exploration of composting. A study of transportation might lead to a study of simple machines. Music and movement are introduced by the music and dance teachers, who integrate social studies themes, which are then brought into the classroom on a daily basis during meetings and routines. In addition, physical activity is highly valued, and children have a combination of structured and unstructured outdoor play daily. In addition to learning about local communities in the present, the 7s through 8s take a historical view. 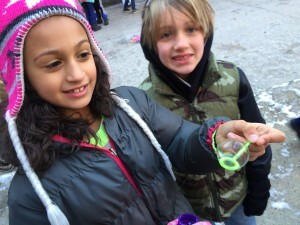 During these years, the curriculum themes are still connected to the local communities within New York City. A study of neighborhoods, starting with the school’s local neighborhood, and then branching out to others to include the diversity within Brooklyn and greater NYC, is a natural outgrowth of the studies in the 4s, 5s and 6s. In addition to learning about local communities in the present, the 7s and 8s take a historical view. The focus within this larger theme is determined by the teacher taking into consideration the interests and needs of the students. Mathematics, literacy, science, music, movement and art continue to be integrated within the social studies unit. Some mathematical concepts may be introduced apart from the social studies theme, but are introduced in ways that connect to the child’s experiences and build from their prior knowledge. In addition to writing around the social studies theme, the children have opportunities for creative writing. A Writers’ Workshop model is used. Literacy is developed through direct reading instruction at each child’s level using a variety of methods appropriate to meet the individual needs of children. During these years, the children look at communities around the world. They explore different types of communities, including urban, suburban, and rural in New York State and the United States of America. Geography plays a significant role, as children learn how these communities are situated upon the earth. Mapping skills are important. Mathematics, literacy, science, music, movement and art will continue to be integrated within the social studies unit. 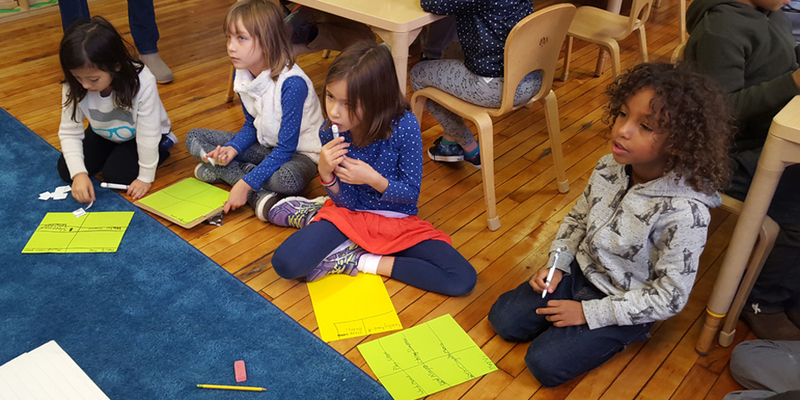 Some mathematical concepts may be introduced apart from the social studies theme, but are introduced in ways that connect to the child’s experiences and build from their prior knowledge. At this point children will become familiar with concepts of algebra and geometry, in addition to concepts that were introduced in earlier years. Reading instruction will be conducted in the content areas during these years, with additional support for those who require it. Studies during these years focus on specific regions of the world, periods in history, or global themes. Mathematics, geography, literacy, science, music, movement and art will continue to be integrated within the social studies unit. Some mathematical concepts may be introduced apart from the social studies theme, but will be introduced in ways that connect to the child’s experiences and build from their prior knowledge. Writing will continue to play an essential role in the curriculum as students write for many purposes. Reading instruction will continue through the content areas.